......JewishGen's Family Finder brought us together in our search for information about our families. We exchanged e-mails and letters hoping to learn more about our Nowy Zmigród roots. Discovering more questions than answers, however, we decided to pool resources and hire a Poland-based researcher to find whatever could be found about "our town" and ancestors. The results of her remarkable efforts on our behalf, coupled with the ongoing research each of us is involved in, provided the data and inspiration for the creation of this web page. Although many records were destroyed over the course of two world wars, our researcher found some information relating to each family. She visited archives and libraries, talked with residents and officials, took many photographs, obtained printed maps of the area, drew a street map of the town and gathered historical information to give us a better picture of the times our relatives lived in and through.......and found that four of the five of us were related!! During the next stage we searched for, and found, folks who were born in Zmigrod. We heard wonderful stories of early family life, and we transcribed these stories onto these pages. 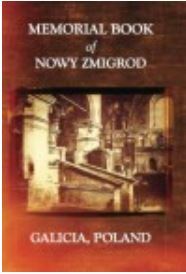 With great sadness, we learned of the fate of the Jews still living in Nowy Zmigród in July, 1942. The murder of 1250 men, women and children by the Nazis touched every family. The development of this web page is our loving tribute to their memory and a legacy for future generations. If you are visiting our page because your family came from Nowy Zmigród (latitude 49° 37´ longitude 21° 32´) or one of the surrounding communities remember that often marriages were arranged between families from neighboring towns, so you may well find information on your surnames where you least expect it. Click on JewishGen web pages expressly devoted to the Krosno Area (krosno is 12 miles ENE of Zmigrod), with stories and photographs from Dukla (8 miles ENE), Korczyna (14 miles ENE), Yaslo (10 miles NNW), Jasienica, Brzozow and Rymanow (15 miles E), Dukla, Frysztak, Strzyzow, and Bukowsko. Other nearby towns: Biecz-15 miles WNW, Jedlicze-9 miles NE, Krempna-7 miles S, Osiek Jasielski-3 miles WNW. Please feel free to contact any or all of us if you have any questions or information to add. Just like our research, this is an evolving project! The photograph on the right shows our reunion with Zmigrod cousins Fred (& Therese) Van Vliet, Max Findling, Phyllis Kramer, Maralyn Steeg, and Max's two sons. click to return to the JewishGen Home Page. Please note: This site exists because of your Generosity. Your tax deductible donation to JewishGen makes these services possible. We organized this information so that your genealogical search might be more rewarding......so, if you wish to reward us in return, just click on Jewish Gen-erosity. 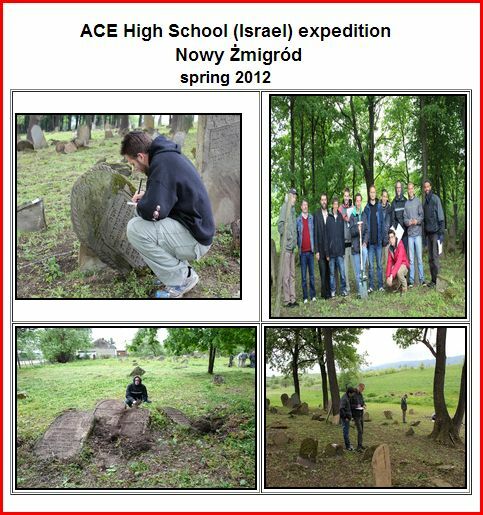 Photos of Zmigrod and the Cemetery from Jerzy Debiec Nov 2009 Can Anyone Translate these Tombstones for us?? 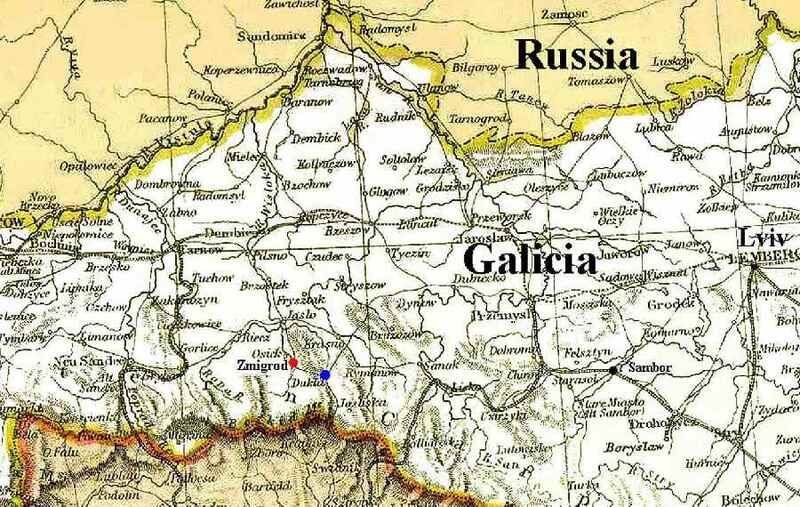 The Carpathian Connection -- interdemoninational web site offering genealogical research and historical education for the Carpathian Mountain region. Want Information on Other Shtetls? try KehilaLinks, over 400 pages written by JewishGenners in memory of their towns! Search our Surname List!!!! over 750 Birth, Death And Marriage Certificates!!!!! The Landsmanshaften Organizations in NY and NJ--Over 200 Names! The yiskor Book and the Story of Halbow by Bill Leibner, Jerusalem; completed March 2015 with large list of names! Two Zmigrod Survivors Revisit Holocaust Sites, by Max Findling and Leo Rosner. The Holocaust Remembered A Book by Leo Rosner. I'm living in Warsaw, about 450 km from Nowy Zmogród. My Mother lives in Wroclaw (400km from Nowy Zmigród). My grandmother Rozalia Wojtas, born in 1908 in Mytarz, died in 1988 in Nowy Zmigród, and she told to my Mother this story and my Mother still remember some details. My Grandmother Rozalia Wojtas, born in 1908 (died in December 1988) was a "housekeeper" in Piwinski Family in Nowy Zmigród. Piwinski Family had a "Traffika" store in the Rynek of Nowy Zmigród. My Grandmother purchased bread for Piwinski Family, and very often she purchased bread in a Jewish bakery - the best in the Zmigród.This Jewish bakery was located on the center of Nowy Zmigród, on the right : going to the top (from North to the South) of the city form the direction of Jaslo in the direction of Katy-Krempna. So probably for this reason she knew this Jewish Family (owner of this bakery), and she called this Family “Berek” Family but I’m not sure that this is a true name or maybe “a nickname” used by Polish people before War. Just after the World War II (in 45) Grandmother Rozalia was contacted by one person of this “Berek family”, probably a survivor, a man about 25-30 years old, not killed at Halbow forest in 1943 and this person looked for member of Berek family- probably 2 sisters (he probably had 2 sisters in Zmigród as my Mother told me). Just after WW II (in 45) my mother was 15 years and this survivor a man, about 25-30 years old told to my grandmother Rozalia that my mother Janina was very similar to his sister and he wanted to take my mother back to USA...My grandmother refused. After WWar my Grandmother Rozalia lived in Mytarz (with my mother Janina).And as I know in Nowy Zmigród there were 2 bakeries just before War but my mother is not sure which one of these 2 bakeries/Jewish family can be involved in. Do you have any information about this “Berek” Family from Nowy Zmigrod , probably owner of bakery? Bobker, A. 1929 City Directory	 Factory of Casquelies? Cieslek, J. 1929 City Directory	 forgerons? Kliszcz, Emil	 1929 City Directory	 Giometres? Nowak, S.	 1929 City Directory	 forgerons? Zrebiec, J	 1929 City Directory	 forgerons? In 2016 FindMyPast.com added many items from the British Archives. The following resulted from a search using Zmigrod as the query point. The images connected with these items contain even more information. Go to http://search.findmypast.co.uk/search-world-records/britain-enemy-aliens-and-internees-first-and-second-world-wars and put Zmigrod into the keyword search field. This KehilaLinks page was created Phyllis Kramer, V.P. of Education, JewishGen Inc. If you have any questions, comments or additions, please email me by clicking here.